A stem that originates from the primary scape and bears two or more buds. 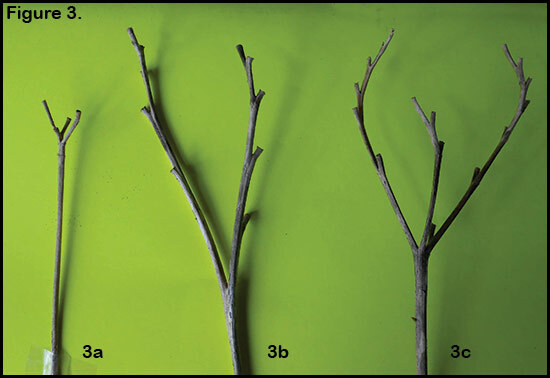 Terminal branching occurs at the top of a scape and may be arranged to form a V (two branches) or a W (three branches – See Figure 3 below). 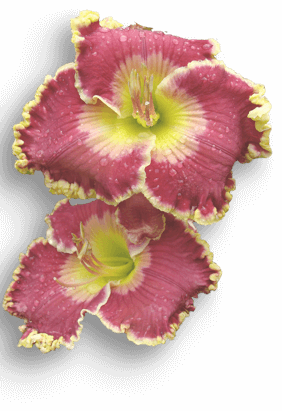 Lateral (side) branches or “laterals” may occur along the scape where there are bracts. 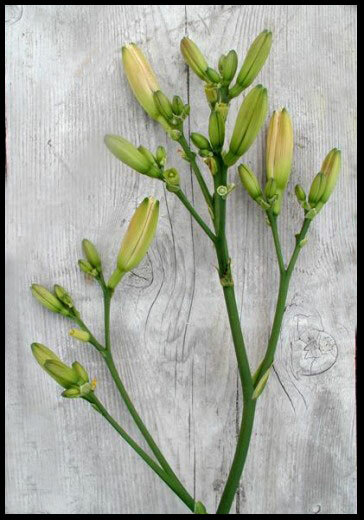 Neither a proliferation nor a stem with a single bud are included in the branch count. Branches may divide into sub-branches. 1. A terminal V is counted as 2 branches and a terminal W is counted as 3 branches. A scape that does not divide into a V or a W at its terminus is counted as 1 branch. 2. The number of lateral branches. 3. Sub-branches are not included in the count of branches. Looking at the photograph provided in Figure 1, and noting the line drawing below it (Figure 2), you’ll find that each lateral stem bearing two or more buds is counted as a separate branch. In Figures 1 and 2 at least two branches split into segments (sub-branches) along their length, with each segment containing several buds, however only stems which originate at the junction of the scape are counted as branches. In Figure 1 (photograph above) and Figure 2 (diagram below), you will see a single bloom scar appearing on the scape itself. 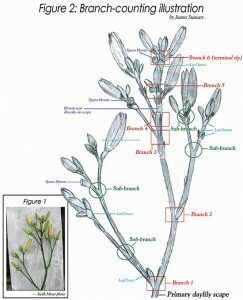 Since the scar indicates the presence of a single bloom, and by definition a branch must exhibit a minimum of two buds, a single bloom scar, even though it appears on a scape, does not count as a branch. Count the branches which appear as stems having a junction with the bloom scape. Using the AHS definition of branching, and using the method for counting as described, the scape shown in Figures 1 and 2 exhibits six-way branching. A scape terminal (the top) may be a single tip with several buds (one branch) ( Figure 3a); it may exhibit V branching (two branches) (Figure 3b); or it may exhibit a W (three branches) (see Figure 3c). Note that the scape shown in Figure 1 (above) exhibits a single terminal, without showing either V or W branching. This example should be counted as having a one-branch terminal.